Domaine du Colombier is owned and managed by the very tall, Florent Viale. At close to 6’8,” Florent Viale could have chosen to play basketball instead of producing wine in Hermitage. While the vineyards have been owned by the Viale family since the first part of the 20th century, prior to 1991, the crop from Domaine du Colombier was sold to negociants. After 1991, they began to produce, bottle and sell their wine. Domaine du Colombier is located in the village of Mercurol which is just slightly due east of Tain, and next to the hill of Hermitage. Domaine du Colombier owns 12 hectares of vines in the Northern Rhone Valley. Their best terroir is the 1.6 hectares they own in Hermitage. In Hermitage, they have old vines as much of their plantings of Syrah are between 50 to 55 years of age that is planted on granite hillsides. Until recently, the only white wine grape planted was Marsanne. However, they have recently added Roussanne to their vineyards. Prior to 1991, the harvest was sold to Guigal. When that contract expired, they began to produce, bottle and sell their own wine. 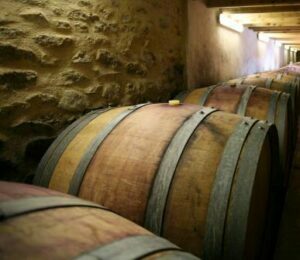 In Crozes Hermitage, they have 9.2 hectares for red wine varieties and 1.2 hectares reserved for white wine in Crozes-Hermitage. Their terroir in Crozes Hermitage has granite, along with clay, limestone, chalk, rocks and stones in the soils. Domaine du Colombier produces 1 Hermitage Rouge wine and 1 Hermitage Blanc wine. Domaine du Colombier Hermitage Rouge is made from 100% old, vine Syrah. The vines are planted in three lieux-dits, “les Baumes,” “Peleat” and “La Grande Diogniere.” The grapes are whole bunch fermented. The wine is then aged for 18 months in 30% new, French oak barrels before bottling. Domaine du Colombier Hermitage Blanc is made from 100% Marsanne. Although that is expected change as their Roussanne vines continue to age. The vines are planted in a small .21 hectare parcel in the Maison Blanche vineyard, with a terroir of limestone and clay. The wine is barrel fermented and aged in an average of 20% new, French oak barrels. Domaine du Colombier Hermitage when young, should be decanted at least 2-3 hours, give or take, allowing the wines to soften and open their perfume. Older vintages might need very little decanting, just enough to remove the sediment. Domaine du Colombier Hermitage is usually better with 8-12 years of cellaring and should be at its best between 10-25 years of age. Domaine du Colombier is best served at 15.5 degrees Celsius, 60 degrees Fahrenheit. The cool, almost cellar temperature gives the wine more freshness and lift. Domaine du Colombier is best served with all types of classic meat dishes, veal, pork, beef, lamb, duck, game, roast chicken, roasted, braised and grilled dishes. Domaine du Colombier is also good with Asian dishes, hearty fish courses like tuna, mushrooms and pasta. The white wine of Domaine du Colombier is best served with a myriad of different seafood dishes, shellfish, crab, lobster, sushi, sashimi, chicken, pork and veal, as well as Asian cuisine. In Crozes Hermitage, they also produce 3 red wines and 2 white wines. Domaine du Colombier produces the following red and white wines in Crozes Hermitage: “Cuvee de Jeunes Vignes,” Domaine du Colombier Crozes Hermitage and a Cuvee Gaby, which takes its name from the grandfather of Florent Viale. Concentrated, forward, full bodied and loaded up with ripe black cherries, smoke, espresso, underbrush and pepper, if you like your Hermitage on the young, fresh crunchy side, you can pop a cork now. Else, give it at least another 5 years or more, and this will be even better. Flowers, honey, citrus peel, white peach, spice and vanilla create the nose for the full-bodied, luscious, richly textured wine made from 100% Marsanne. Rich and with that oily texture that comes easily with 100% Marsanne, here you also find bright notes of buttery, yellow fruit and honeysuckle, vanilla and floral characteristics. Young, powerful, intense, quite tannic, full bodied, concentrated and not ready for prime time drinking for at least a decade, or longer. Still, it's hard to miss the earthy, dark, red, fruit, crushed rock, olive, forest leaf, and peppery essence that comes out with effort. Not a wine I see often. Poured blind by a good friend, the wine is dark in color, with concentration, intensity, tannin and loads of fresh, sweet, juicy blackberries and thyme. Rich, soft, vibrant and young, this will be smoking by its 10th birthday.